Thinking of how to start a worry-free lifestyle while changing the world? 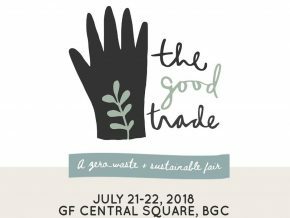 Prepare yourself and be part of the community that makes an impact as The Good Trade PH will be having its first “Zero Waste + Sustainable Fair” at GF Central Square in Taguig City. The fair will run from July 21 (11 a.m.-11 p.m.) to July 22 (11 a.m.-10 p.m.). If you’re looking for refillable and zero waste tools, curating an ethical capsule wardrobe, or shifting to a vegan skin care routine, the two-day event will be a perfect match for your penchant for purpose-driven and eco-friendly stuff. With an aim to empower a community to live its life in a pleasing style, the Good Trade PH has gathered several brands that can fill your ecological desires. For Bulk Food and Homemade Snacks, the participating merchants are humble market and Pinkie’s Farm, while for Ethical Fashion, they’ve got ANTHILL Fabric Gallery, Candid Clothing, Indayog PH, Lumago Designs, Neotiv, Pulseras by Kim, STYLE ISLE, TALA, Twelve PH, WVN Home Textiles. The Artem Skincare + Apothecary, Daniela Calumba, Got Heart Shop PH, Lana, Luna Maja, Mayumi Organics, Organic Alley, Ritual, The Olie Mixte, Weekend Kids and Zero Basics are also joining for those who are looking for refillables and personal care. For zero-waste tools, Cupping Initiative, Frank Green Philippines, Sip PH, The Simple Trade, Graphic Image, How Toteful will also take part in the upcoming event.Other invited brands are Alpas Pet Accessories (Cause-driven), Milvidas (Cause-driven), Meaningful Travels PH (Sustainable Travel), P.S. Crafts with Soul (Upcycled), Vitrum Upcycled Bottles and Crafts (Upcycled), Woodstuff Ph (Upcycled). Aside from the aforementioned merchants that surely offer cost-effective products, the said fair will accommodate items to be repaired and recycled. So, if you have piled empty containers you still want to use for other purposes and clothes or shoes you want to fix or donate, don’t hesitate to bring some! Practical tips and step-by-step guides will also be given. Gladly, guests and consumers have nothing to worry about as they can swing by and register for free!